The New York Times bestseller by the acclaimed, bestselling author of Start With Why and Together is Better. Now with an expanded chapter and appendix on leading millennials, based on Simon Sinek's viral video 'The Millennial Question' (150+ million views). The answer became clear during a conversation with a Marine Corps general. 'Officers eat last,' he said. Sinek watched as the most junior Marines ate first while the most senior Marines took their place at the back of the line. What's symbolic in the chow hall is deadly serious on the battlefield: Great leaders sacrifice their own comfort--even their own survival--for the good of those in their care. Too many workplaces are driven by cynicism, paranoia, and self-interest. But the best ones foster trust and cooperation because their leaders build what Sinek calls a 'Circle of Safety' that separates the security inside the team from the challenges outside. Love this book. So inspiring. Simon makes a case scientifically, anthropologically, and historically that when we invest in people, valuing their well being above numbers, and relationship before profit, everyone benefits, including the business and shareholders. There are some good nuggets of information that you can take from this book, but I have a hard time linking everything that occurs to chemicals found within the body. There is a lot to be said about being a servant leader. That is the type of leadership that I strive for, and I don't always achieve that goal on a daily basis. The book got off the rails when it started to skew itself to being a book about servant leadership and more about the plight of capitalism. Unfortunately, there are decisions that are made in the business world that have to be based on dollars and cents. Not everything can be blamed on corporate greed. Believe it or not, there are a lot of CEO's in the world that are not greedy. 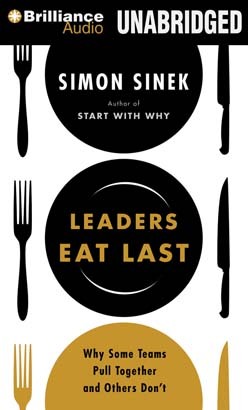 I have been really enjoying this book, great for any upcoming and current leader. This book is 50% reasonable and 50% garbage. He actually says shareholders don't own corporations. In what world? Activist shareholders are always quick to remind the board and management that they (shareholders) do in fact own the corporation. He also compares a company firing employees in a bad year to a family getting rid of their kids in a year they make less income. Really? The people I supervise aren't my kids and the two situations aren't even close to being the same. And oh by the way, if a company doesn't make hard decisions to let some people go in tough times, it might cost everyone their jobs if the company ultimately goes under because management refused to make the difficult and unpopular cuts. Lose some jobs or lose all jobs? The answer is pretty simple. The 50% of the book that is reasonable is that which points out that servant leadership - as opposed to tyrannical leadership - is a more productive leadership style. But the New Testament already told us that. That said, I only finished 3/4 of the book. I feel inspired after listening to this book. Sinek does a good job of using science but keeping it easy to understand. He uses many examples- enough that no matter who you are or what you do, you will be able to relate to this book and find it relevant to your life. I plan to incorporate many of his leadership philosophies into my college classroom teaching practices when the next semester begins. Valuable read to challenge one's view of leadership and how to execute that effectively. It's an excellent read that will teach you why CEOs, and others "at the top" do and act the way they do and what they're doing wrong if they want to truly grow their business. "Put people before numbers." Worth the read for entreprenuers. Great book on understanding leadership and how a team should function.